"Scanning the piece of paper with his finger as he read," Trump yesterday -- during a visit to the National Museum of African American History and Culture -- "read carefully from prepared remarks decrying bigotry and specifically condemning a wave of recent threats against Jewish centers across the country." "Read carefully" means read haltingly, with effort, because, as we know, the man does not read. Someone made him do that and wrote out the words for him, not allowing him to free-wheel it in Trump style, because he very likely would have blurted out something that would have further exposed his stone-cold racist heart. Last Thursday at his first press conference as president, Trump called himself the “the least anti-Semitic person that you’ve ever seen in your entire life,” and, also, “the least racist person.” He was angry that a Jewish reporter had asked for a presidential statement on recent bomb threats at 48 Jewish centers across the nation (and more than 170 Jewish gravestones were found toppled at a cemetery in suburban St. Louis, over the weekend). Trump took the question personally -- wonder why? -- even though the reporter carefully prefaced that he wasn't asking nor implying anything about the president's personal views. 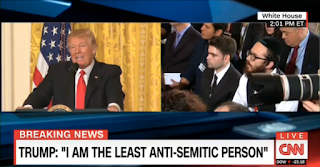 Trump then told the Jewish reporter to sit down and shut up, because he was just another example of the "fake news" media. Trump later claimed that his "opponents" are committing anti-Semitic acts to fuel outrage against him. "Some of the signs you’ll see are not put up by the people that love or like Donald Trump. They're put up by the other side and you think it's like playing it straight, no, but you have some of those signs and some of that anger is caused by the other side." The other side did not cause the White House to release a statement on Holocaust Remembrance Day that did not mention the Jewish people or anti-Semitism. It was not the other side that caused Trump suddenly to not know David Duke and refuse to condemn his explicitly racist endorsement of Trump's presidential bid. It was not the other side that installed Steve Bannon next door to the Oval Office -- Steve Bannon who made his fame with the explicitly racist and explicitly anti-Semitic Breitbart News. The racism is embedded, as is the narcissism, and what goes with narcissism? A disorienting insecurity about how one appears and a neediness for approval, so yesterday at the National Museum of African American History and Culture, Trump's insecurity and neediness induced him to read a statement against racism, carefully tracing the words with his short fingers, a statement that someone else wrote for him and told him to read word-for-word, because whoever wrote the words knows that Trump in his heart has no real understanding of what those words mean.